The NIHR Senior Investigator award is a very prestigious award lasting 4 years (2016 to 2020) and builds on Nadine’s current NIHR Research Professorship (2012-2017). Nadine is only 1 of 3 physiotherapists nationally to have been awarded Senior Investigator status, in recognition of the contribution of Nadine’s research to patient care, the quality of her research and her track record in developing capacity for applied health research in the NHS. This is a great honour for Keele University, and is the third such award within the Arthritis Research UK Primary Care Centre following on from successful awards to Professor Peter Croft and Professor Elaine Hay. Senior Investigators are the NIHR’s pre-eminent researchers and represent the country’s most outstanding leaders of clinical and applied health and social care research. Senior Investigators are fundamental to the formation of the NIHR Faculty and provide research leadership, promoting clinical and applied research in health and social care, help in planning and speaking at events, host visiting fellows and mentor Trainees, constitute a network of experts, able to provide advice to the Department of Health's Director General for Research and Development. Senior Investigators receive an award of £15,000 a year as a personal discretionary fund, and attract additional NIHR Research Capability Funding to the main NHS organisation with which they hold a contract of employment or an honorary contract. The annual NIHR Academic Clinical Fellows (ACFs) conference was held at the Grand Hotel in Brighton, 17th -18th March 2016. Emily Wersocki (ST4) gave an excellent presentation on her work with CPRD exploring the effect of long term opioids for non-cancer pain, on menstrual irregularities and the menopause. Emily will be applying for an In-Practice Fellowship this time round aiming to extend this work. Annabelle Machin (ST3) reported the initial analysis from her qualitative study, exploring the views of patients with Rheumatoid Arthritis about an annual review which incorporates the case-finding questions for anxiety and depression. Questions from the audience were helpful in modifying the topic guide for the next few interviews, as well as thinking about the analysis. Victoria Silverwood (ST2) presented her qualitative study, which explored medical students’ perceptions of Fibromyalgia, as a poster. She is currently preparing this study for submission to PEC. Dinner on the Pier at The Palm Court Fish and Chip restaurant was an experience, and some of us saw more of Brighton than others. As usual, the standard of all the presentations was excellent and the opportunity for networking was much appreciated. I think we can say that the future of academic general practice is safe in the hands of these enthusiastic, motivated and very clever ACFs who made the trip to sunny Brighton. 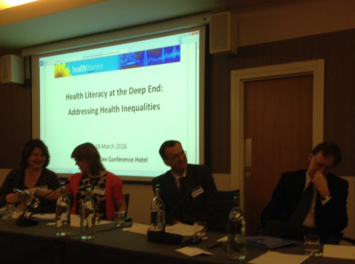 “Health literacy at the Deep End”, 4th UK Health literacy Conference March 18th 2016, Glasgow. Ever since the Closing Ceremony of the 3rd UK Health Literacy event there had been a steady build up to the 2016 Health Literacy Games, hosted for the first time in Scotland. Key players gathered from across the four devolved health nations to the newly rebranded Golden Jubilee Stadium (formerly the Beardmore) in Clydebank. The place was buzzing, in part due to a huge rival contingent from the Glasgow Orthopaedic Research Initiative (GLORI). This was a nervous first time for me officiating at such a major event but comforting to meet up with seasoned-pro Dr Jo Protheroe from Team England, along with other members of the organising committee at the pre-tournament dinner at Roastit Bubbly Jocks. Fantastic also to chat with old friends such as Jonathan Berry and Gill Rowlands. Nerves must have been high at the pre-tournament breakfast the following morning when I poured coffee over my official match suit trousers, whilst filling the cup of veteran England International Dr Sue Roberts. Crowds filled into the floodlit Arcoona Suite for the Opening Ceremony. Dr Jo Protheroe gave a warm welcome and handed over to Liz Sadler, Deputy Director of Scottish Government’s Planning and Quality Division. She was a last minute substitution for Maureen Watt MSP, Minister for Public Health, who sadly had to cancel because of illness. Liz expertly set the scene of Clydebank’s, rich past but also the social and economic struggles it now faces in our post-industrial age. She reminded us how these social challenges impact on people’s health and those with the lowest health literacy and support suffer the most. She urged us all to share in Scotland’s ambition to enable all of us to be a health literate society and our part in helping to bring out the best, in those that struggle the most, to live well. She also crucially reminded us that the boyband, Wet Wet Wet, were an intrinsic part of Clydebank’s cultural heritage. After forgoing the national anthems, I brought play under way at about 10.15. Team Scotland had won the toss and local hero Prof Graham Watt kicked deep. He challenged us to think what Health literacy really means. He gave us a stark reminder of the key role that primary care has in responding to the challenges that health and wellbeing place on people living in deprived communities. Helping people requires investing in time and continuity to ensure empathic relationships. Primary care is a natural hub to build connections of health and social support for people and communities which is key for people with the highest health literacy needs. England’s skipper Jo Protheroe then took procession taking play back up to half way. She shared her research that she had done with England & British health literacy Lion, Gill Rowlands, describing the mismatch between the level of information compared to people’s literacy and numeracy skills. She then described the inspiring collective action that the community of Stoke on Trent had taken to respond to people’s health literacy needs, not without mentioning the industrial legacy of Stoke’s potteries. She then took a beautiful kick at goal for 3 points with a quick-thinking reference to local pop-legend Robbie Williams. This brought Northern Ireland into proceedings with Dr Bernadette Cullen from Belfast Healthy Cities. She gave a fantastic presentation of their journey in addressing health literacy in response to Phase VI (2014-18) of the WHO Healthy Cities Initiative. She described the city wide collaboration of innovative stakeholders that had been brought together to make the case for change, map what they currently provide and plan areas for development. I couldn’t help notice that in one of her photos there was a picture of one of Scotland’s health literacy heroes Christine Hoy, on loan to Team NI! I was also impressed by the linkage with music legend, Van Morrison. The ball was then fed to Welsh international Prof Adrian Edwards. He got off to a great start bringing the crowd to their feet evoking the Welsh singing talents of Katherine Jenkins, Bryn Terfel and, of course, Tom Jones. He initially slipped a dummy by giving the impression they were early on in their health literacy journey in public health policy terms, involving scoping the levels of health literacy in Wales. He then gained several yards, pushing deep into opposition territory, describing their quite considerable action and implementation around shared decision making, the pioneering Prudent Medicine programme and engagement with Ophelia. 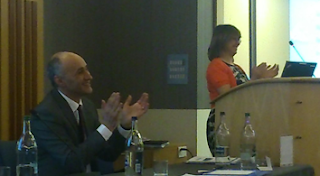 Unfortunately with the clock ticking down I had to blow the whistle for a lively panel discussion.